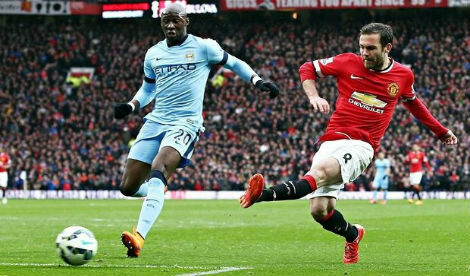 Manchester’s elite clubs clash for the second time this season on Sunday. City are for a change above United heading into the game that’s already being dubbed in some quarters as a ‘title decider’. United are looking to regain top spot and inflict a first league defeat of the season upon City. Last season was a great success for City; the FA Cup triumph and Champions League qualification meant Mancini was hitting his targets. This season they have started well and appear to have progressed further now, into real title challengers. After three seasons of spending more than £100m, City spent only £88m this past summer with Sergio Aguero, Samir Nasri and Gael Clichy being their big name acquisitions. At £38m, Aguero became their record signing (depending on how much you consider the Tevez deal to be worth). His signing along with Nasri’s were signs of ambition from the club as quality was brought in. Clichy never quite fulfilled his potential at Arsenal but is very sound business at just £7m. Dead-wood players like Jo, Wright-Phillips and Bellamy were allowed to leave whilst the club made a £4m profit on Jerome Boateng, selling him to Bayern Munich just a year after he was bought. One player City failed to get rid of was Tevez. He’s not happy at the club, in Manchester or in England but no one will take him at the wages he wants. His influence at the club can only be a negative one right now as he continues to be at the centre of problems – most recently he’s been accused of refusing to come on as a substitute. For all the furore surrounding Tevez, it must be said that everyone else just got on with their jobs and in the case of David Silva, he’s gotten on with it particularly well. The Spaniard has arguably been the best player in the league this season and has been a joy to watch. His ease in possession coupled with an eye for a pass have made him a key player for City – his magic left wand of a foot is very much their creative spark. The other person who’s stayed strong is Mancini. He’s lead the club well and refused to be bullied by the large egos. His handling of the Carlos Tevez situation was superb, he’s showing he’s an excellent man-manager. His suave character and refreshingly honest interviews have made him a very likeable character – shame he’s at City really. City can win the league this year, the quality is there. They need some luck though as winning experience is not something they have much of. Champions League qualification is the bare minimum one would have thought as league position will take priority over domestic cup runs. Chelsea and United have a new challenge now! 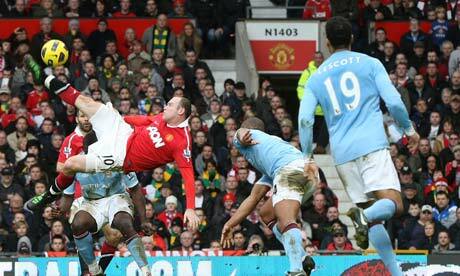 Wayne Rooney is the league’s top scorer with 9 goals, City’s Aguero (8) and Dzeko (6) are second and third respectively. Assists-wise, City have the top two men – Nasri (6) and Silva (5), although United newbie, Ashley Young also have five assists. City are currently the league’s top-dogs. A nice start fixture-wise has seen them hit the top as the league’s top scorers too (27 goals in 8 games). If they hadn’t thrown a lead away at Fulham, they’d have a perfect record. Oddly City have scored more goals away from home (14) than they have at home but concede on average more than one goal per game. They come into this game off a run of three wins in all competitions – they came from behind to beat Villarreal midweek. Sir Alex has declared the United squad to be “fully fit”. Tom Cleverley has only just started training so his involvement would seem unlikely, the same goes for Rafael. Vidic should start after missing Liverpool whilst Ferdinand is likely to be recalled after sitting out the trip to Romania. Darron Gibson remains injured. Mario Balotelli has been in excellent form and could return after he missed the midweek Champions League tie through suspension. Micah Richards should be passed fit after a head injury whilst Carlos Tevez won’t be involved because of an internal discipline issue. Owen Hargreaves will be assessed last minute to see if he’s fit enough to be in the match squad. Ferguson has a big decision to make tactically going into this game. Show Man City the respect they probably deserve and match their formation (4-2-3-1) or play more of a 4-4-2/4-4-1-1 that has suited the side better but is likely to leave plenty of space for City to play in. Personally I’d go for the former, keeping the game tight and cancelling City out man for man. De Gea may well have something close to a first choice defence in front of him for this game. Certainly the pairing of Ferdinand and Vidic will add plenty of experience and quality as well as serving as a reassurance for the young goalkeeper. Evra has looked much like his old self in the past few games – his attacking play remains so important to United. At right back it’s between Jones and Smalling with the latter likely to get the nod due to his positional discipline and good form. The midfield provides a few dilemmas. Cleverley is fit but hasn’t played in over a month and is likely to be rusty – more to the point this would be a huge game to suddenly throw him into. Anderson has been a regular but his form has been poor and he was dropped for the game at Anfield last week. Fletcher was rested midweek in Romania and seems certain to start but who partners him is anyone’s guess. Carrick was excellent in Romania and tends to like the bigger games so he’d be my choice – he could sit deep, screening the back four and providing some calmness to what will almost certainly be a hectic part of the pitch. Giggs may or may not have a hamstring injury depending on whether you believe Fergie or some of the papers so ahead of Carrick and Fletcher, big-game-Park may come in, offering energy, discipline and a will to unsettle City. Out wide, Nani and Young provide clever, quick wingplay in a bid to support Rooney who cannot be isolated on his own up front. Rooney may be used in the Park role allowing one of Hernandez or Welbeck to start. What about a surprise? No idea why but I think the Fergie surprise tomorrow could be the inclusion of Berbatov. “Though placed first and second in the Premier League standings, it remains clear that both Ferguson and Mancini have issues to be resolved tactically. In short, United seem to be struggling with the space just in between defence and midfield and have struggled to control the middle zone post-Scholes; whereas City seem not to have found the ideal solution in the final third. You can read the full article which goes into detail about each sides tactical start to the season, here. The 145th league meeting between these two sides hopefully won’t produce the 50th draw. Rather, United will hope to seal their 10th home Premier League win over the noisy neighbours. United have a good home record against them, winning 9 out of 14 games and average two goals per game whilst they concede less than one a game. The only 0-0 draw in recent history was in 2004/05 whilst City’s one win at Old Trafford in the Premier League was three years after that on the 50th anniversary of the Munich Disaster. Last season this fixture ended 2-1 to United. Nani’s super striker from a clever Giggs flick is all but forgotten because of what ensued later. The scores were levelled through a heavily deflected Dzeko goal before one of the great Old Trafford goals was scored… Rooney’s overhead shinkick was the perfect winner for a man who’d had a poor game and poor season. It was the moment he won many fans back over. The two top scoring sides in the league coming head to head will probably only make for a bore-fest as they cancel each other out. One goal will always change the complexion of the game and that could be crucial in this one. I can’t see United losing and I think both sides would be quietly happy with a draw. However, United haven’t dropped points at home in over a year now and I therefore will predict a 2-0 United win. Mark Clattenburg – took charge of the derby back in 2007. This will be his sixth top-flight game of the season. At present he’s averaging only two yellow cards per game with 80% of them coming in the second half. He’s shown one red card and tends to ever so slightly favour the home side. Geography aside, Carlos Tevez and Owen Hargreaves were recently both playing (or recuperating from injury) in the red of United. Berbatov famously turned down City for a move to United whilst last season, Rooney was heavily linked with a move across the city. – Cristiano Ronaldo is the only player to be sent off twice in this fixture in the Premier League era. – It’s 17 years since the last hat-trick was scored in this game, it came from Andrei Kanchelskis. – Two goals from Rooney would see him equal Cantona as the highest scorer in this fixture in the Premier league era with 7 goals. Micah Richards on United: “To get that banner down is quality – we have got the last laugh. We are not going out and saying we will win this game or that game, but they call us the noisy neighbours. I think they’re a bit frightened.” – errr yes, Micah, after 35 years winning an FA Cup is very much having the last laugh! For all pre-match banter, tactical discussions, team and score predictions click here. Pre-match blog looking at how each side has performed tactically so far this season. Great preview mate as usual. mancini likeable character?? 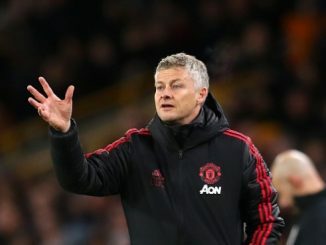 you kidding us or that, i mean he’s total knobhead obssesed with united (we catching up on them), and he like a gay really, doesn’t command any respect at all – great man manager?? – to slate his players publicaly , i mean he’s total disgrace mancini, hope he leave premier league sooner rather than later. and there is question marks about him as a manager – for example every manager in the world with resources that he have (100 mil everyyear on players) can do better than him in fact, or his way of buying succsess – he never buys young prospect or something he just buys ready made superstars buy outpaying everybody around with dirty dictatorship of a worst kind, money.. and for you its admirable – you need to sort out yourself on this one mate..! @minimal – couldn’t disagree more. He’s honest and dealt with awkward situations superbly – particularly the Tevez saga. He’s done very little wrong at City, won a trophy, got them in to the Champions League and now they’re challenging at the top. It’s not his fault that the club have so much money to spend and if he has that resource why shouldn’t he use it. He never buys a young prospect? Savic? You can’t slate him for having the money available to buy good players. Obviously that won’t be Fergies lineup! I don’t think you’ve predicted 1 lineup the whole season so I reckon u should scrap it from now on. Fergie does what he wants. @nameonetrophy- -it’s terrible man!! get a grip. they are ruining football and tarnishing its name!! @minimal – right but “they” are not Mancini. He’s just the manager… he’s not the owners. I think you’re confusing the roles of the two! Max/NameOnTheTrophy – you could have a contest trying to predict SAF’s line-ups and the winner over 38 matches would probably be very lucky to get about five correct. think if we play 4-4-2…we’ll play park on left,who comes in and helps the 2 midfielders. Park,Cleverley,Fletcher,Nani;Rooney,Welbeck for me. If 4-5-1.. then young,Anderson,Fletcher,Cleverley,Nani;Rooney. What a disgrace we were, City had us for dinner!!! 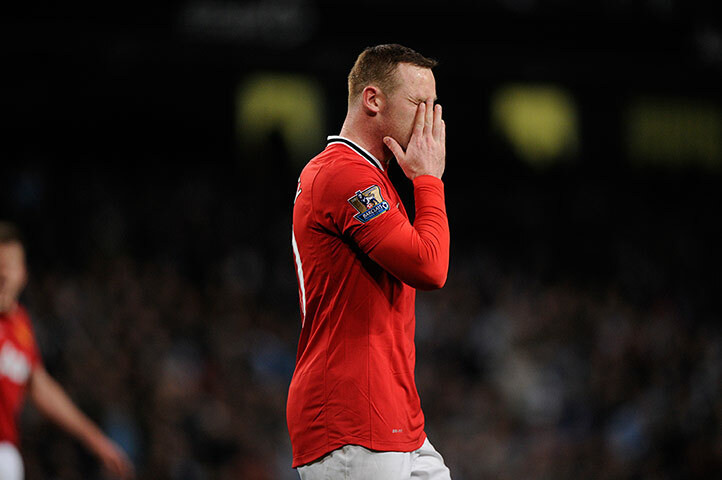 !…………..we look useless and got lucky last week at the dippers but today was humiliation, Is it time for SAF to go??? ?